Al Qaeda and ISIS are « Nuclear Threats », What About Hillary Clinton? 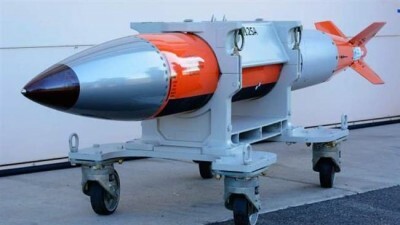 America’s B61-12 mini nuke portrayed as an instrument of peace. “The danger of a terrorist group obtaining and using a nuclear weapon is one of the greatest threats to global security,” said Obama at the Nuclear Security Summit attended by more than 50 world leaders in Washington. A nonsensical statement. The focus on ISIS « madmen » capable of developing a nuclear bomb is an obvious smokescreen, a PR campaign to dissipate the fact that the danger of nuclear war largely emanates from decision-making at the highest levels of US government. The potential role of Al Qaeda and ISIS acquiring nuclear capabilities borders on the absurd, not to mention the fact that ISIS is supported by Turkey and Saudi Arabia, America’s closest allies. The Al Qaeda legend is being used to distort the most likely causes of nuclear war, as well co-opting international leaders into accepting US global hegemony with regard to the control over nuclear weapons and nuclear materials. Moreover, lest we forget, US intelligence has acted as a sponsor of Al Qaeda since the heyday of the Soviet Afghan War. If Al Qaeda and ISIS constitute a nuclear danger, who are their State sponsors? The dangers of nuclear war are nonetheless real. The US is developing a trillion dollar project which consists in refurbishing its nuclear arsenal, not to mention the development of the B61-12 tactical nuclear weapon. Tactical nuclear weapons or so-called mini nukes (with an explosive capacity of one third to six times a Hiroshima bomb) were cleared by the Senate in 2002 for use in the conventional war theater. They are considered « harmless to the surrounding population because the explosion is underground » according to scientific opinion on contract to the Pentagon. The mini-nukes portrayed as instruments of peace are bona fide thermonuclear bombs with a lower explosive capacity. Turkey has 90 tactical B61 nuclear bombs at its Incirlik air force base, which are deployed against targets in the Middle East. 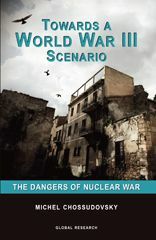 The Nuclear Security Summit is a propaganda ploys intent upon distorting the nuclear threat which largely emanates from the US and its NATO allies under the Pentagon’s post 9/11 nuclear doctrine, which consists in the use of nuclear weapons on a pre-emptive first strike basis against nuclear as well as non-nuclear states. Since the first Nuclear Security Summit in April 2010, neither the discourse nor the agenda has changed. What Washington wants is to gain a monopoly over nuclear weapons as well acquire and control nuclear materials. The issue of terrorism is a smokescreen.